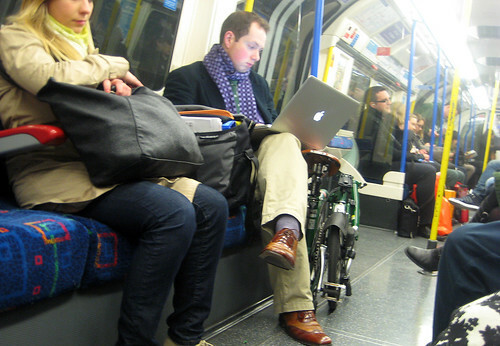 The BBC were doing some tests of Wi-Fi on the London Underground today at a secret location. It seems to be "pretty fast" right now, but Rory Cellan-Jones said "let's see how it goes when thousands are using it". He also had the privilege of sending the first tweet, saying, "Historic first tweet from deep under London using @TFLofficial @virginmedia new tube wifi service - testing, testing." Guesses on the "secret location" appear to be favouring Warren Street. 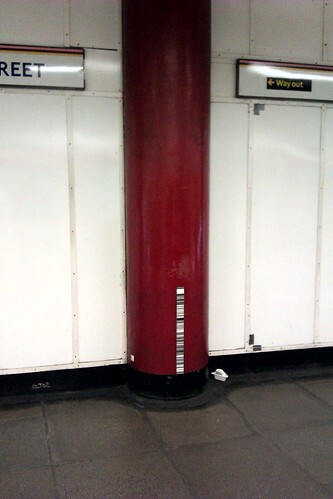 So if you're travelling through the station today on the Victoria Line look out for the sensors on the tunnel roof. Wi-Fi has been promised at 80 stations. The Virgin Media contract is only for ticket offices, escalators and platforms because it would have required major construction work to have added connectivity to the network's tunnels. But if you are on the Tube in an area within the stations covered, there may be enough range to pick up a connection on a train itself. 120 stations will be fitted out by the end of the year. After the period of free access to all during the Olympics, Virgin Media's broadband & mobile customers will get continued access as part of their subscriptions. Other non-paying users will be limited to a site showing online travel information. Thanks to Lloyd Davis for alerting me to this. Did you know that a group of Labour MPs have signed a Parliamentary motion urging that the London Underground Jubilee line - should be re-named the Elizabeth Jubilee Line to mark the Diamond Jubilee? Here's what they said "this House expresses its profound gratitude to Her Majesty The Queen for her dedication to public service; welcomes the opportunities over the coming months that the nation will have to celebrate her Diamond Jubilee, a landmark that only Her Majesty and Queen Victoria have reached out of the 41 monarchs who have reigned in England and the UK since William the Conqueror; notes that the Jubilee tube line is so named in celebration of Her Majesty's Silver Jubilee in 1977; and, in celebration of Her Majesty becoming only the second Monarch to reign for an exceptional 60 years, calls for the Jubilee Line to be renamed the Elizabeth Jubilee Line, to commemorate the great occasion of this Diamond Jubilee year." It has been signed by six MPs. Ermmm, I can't really see them having much luck with that. What do you think? On the subject of Jubilees, even though the Queen's Golden Jubilee was only 10 years ago, I have very little recollection of it. It was the year before I started blogging, I wasn't exactly cataloguing my thoughts and sights on the Tube in the same way I do now. 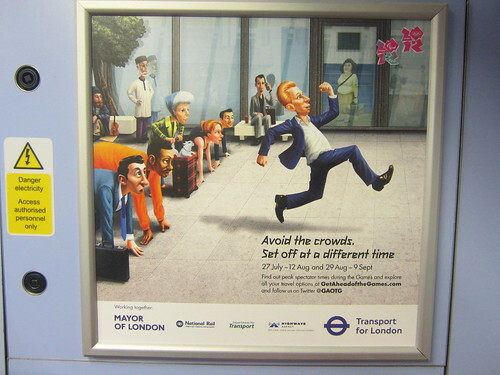 I'm struggling to remember if there were any posters on the London Underground relating to the event. I'm guessing there must have been. 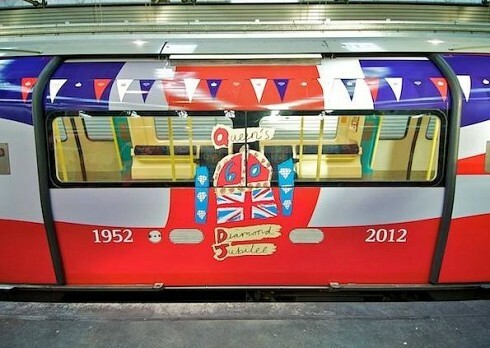 This got me thinking about the Diamond Jubilee and TfL's efforts to "publicise" it. My favourite is one with a pair of corgis looking into a laptop. You'll also see the Queen peering into her laptop and one of her Maj's guardsmen in a bearskin checking out the travel plans too. So far so Jubilee. 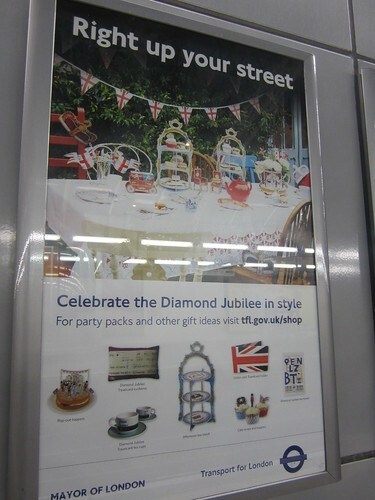 Slightly more puzzling is TfL's attempt to cash in on Jubilee parties. They're selling a host of "party packs" - cake decorations and tea stands with no relation to transport at all. However, some Jubilee travelcard cushions, cups and tea towels are also added to the poster, for those who think that TfL actually ought to sell transporty things. 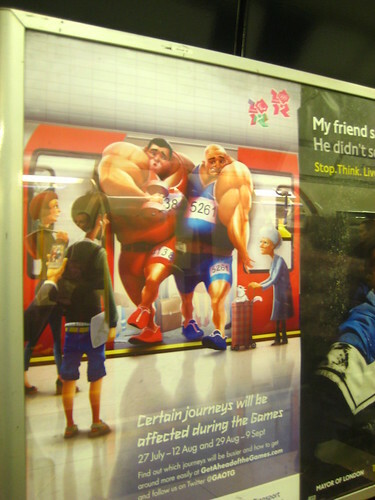 However, TfL aren't the worst people trying to cash in on the Jubilee. I've seen a number of posters on the Tube with crowns, Union Flags and the words "Right Royal" randomly added to them. 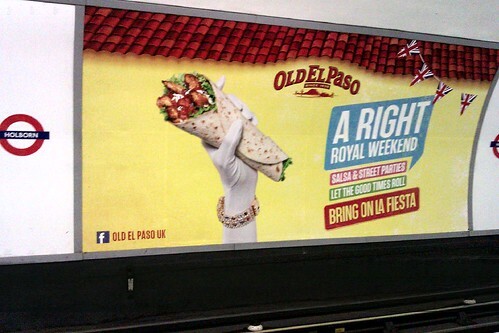 My favourite of these "Let's try to Jubilee Up our products" is this poster for that well known British Food - the Mexican wrap. Obviously your first choice of grub when throwing a Jubilee party. 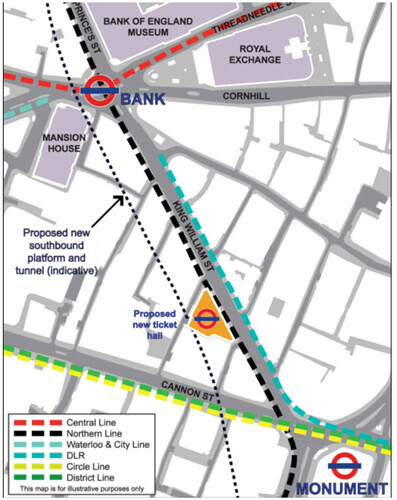 London Underground have unveiled more proposals to relieve the congestion around Bank station. They are on public dispay from Monday 28 May 2012 and will run until Friday 1 June inclusive from 8am - 6pm. 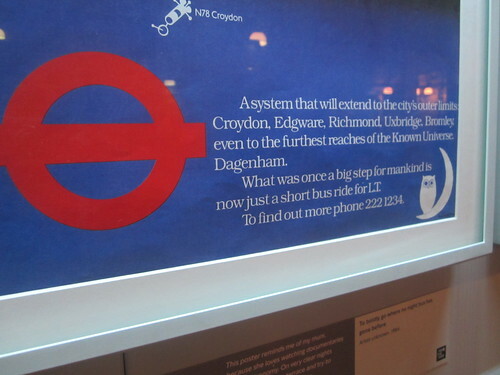 TfL received more than 200 responses to a consultation, and these have been used in the project now on display. They're investigating two options for acquiring land to build the project and three options to locate a new station entrance. David Waboso, London Underground's Director of Capital Programmes, said: "Bank is one of the busiest stations on the network and we've been working closely with the City of London Corporation on plans to create more capacity at this important interchange. "Most of the work will be below the ground and we'll keep disruption to a minimum during construction, but it's important that the public have the chance to comment on what we're proposing to improve their Tube network." Members of the project team will be available to answer any questions about the proposals at an exhibition at the Guildhall Ambulatory, corner of Aldermanbury and Gresham Street, London EC2V 7HH. To find more information about the project and contact the project team, visit the project website. He said "I really hope that people will vote for the 3rd option (large building with escalators) - I can't imagine anything else being suitable for the future. The project will be completed in 9 years - who knows how much more people will be in London by then!" 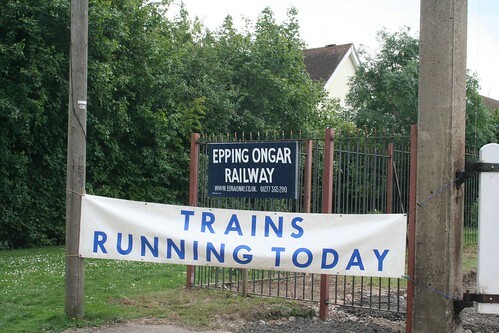 Don't forget that the Epping Ongar Railway will be resuming steam and heritage diesel hauled passenger trains on the former end of the London Underground Central Line from today Friday 25th May 2012 and over this weekend . For the first time in 55 years you'll have the chance to travel on a steam train on the Epping Ongar branch of this Tube Line. Volunteers have been working towards restoring on the track, signals, buildings and rolling stock. They'll also be running this service, throughout the summer on every weekend and Bank Holidays (including the Jubilee bank holidays) and also daily during the Olympics at nearby Stratford. 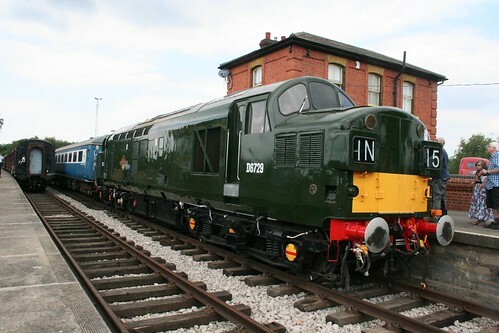 The railway will operate steam hauled passenger services between Ongar and North Weald, a diesel shuttle from North Weald into Epping Forest, and a heritage bus service connecting to Epping LUL Station and High Street. The last Epping-Ongar service ran in 1994. At the time the line was only carrying a mere 80 passengers a day. However, the train that ran the final London Underground service on the line, a three-car unit of 1960 stock, has been preserved by Cravens Heritage Trains. After a variety of special opening days, at the end of 2007, the railway was sold to a new private owner who was committed to bring steam back to the line. You can book your tickets from this website and the full timetable & fares are here. Follow @eorailway on Twitter to keep up to date. 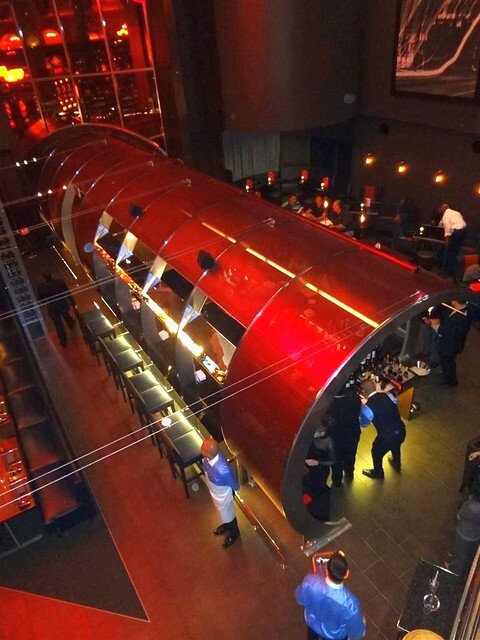 Advanced booking for the first weekend is strongly recommended. Many thanks to Shell for initially telling me about this. Looking for Banksy? Helpful London Underground staff are pointing out the way to Banksy's new "artwork" on the side of Poundland in Turnpike Lane. 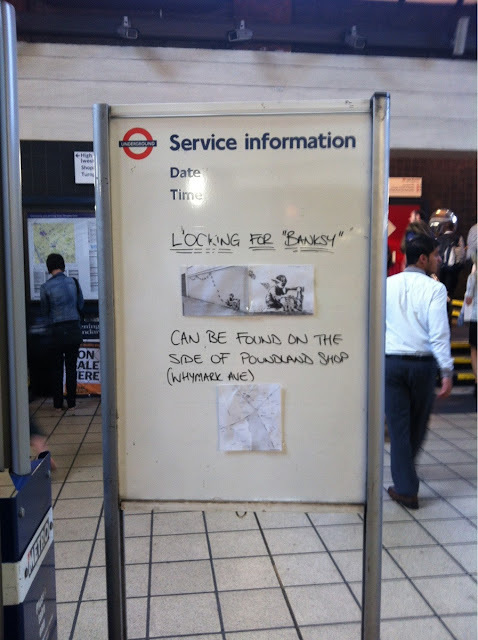 Possibly tired of being constantly asked where the Banksy is, station staff are using the whiteboard to act as an "art guide". The street art believed to be a genuine Banksy will not be removed from Turnpike Lane. The image popped up on the side of a Poundland store in Whymark Avenue last week. It shows a young boy using a sewing machine, and has been covered with a sheet of clear plastic to protect the work from damage. The Olympic Torch Relay will travel past the picture as it travels through Haringey on July 25. Time for another Guess Where Tube. For visitors unfamiliar with the "Guess Where Tube" game it's where I ask you to guess from exactly where on the London Underground, certain pictures from the London Tube Flickr group were taken from. Worryingly, I've seen posters like this on a number of the stations that I use on a daily basis. So me and all the passengers using 88 of the "hotspot" stations aren't going to have an easy time during the 2012 Games. Obviously it's one of the 88 stations we've been advised to avoid and I'm guessing all regular London commuters are going to be seeing these posters popping up on all of those stations. There's no prize for getting it right (mainly because I think it's pretty easy), just the satisfaction of knowing you were right. 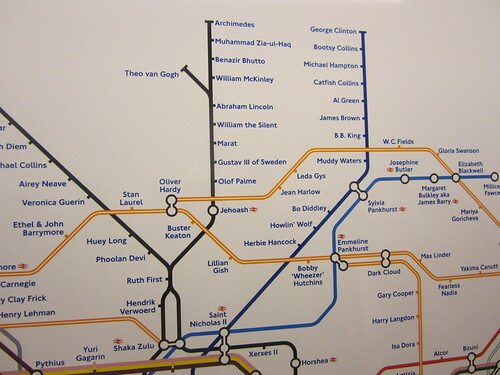 Tube Map "mash ups" are so popular that even people like Paul McCartney are getting in on the act. To celebrate the release of the re-issue of Paul and Linda McCartney's 1971 album 'RAM', Paul McCartney has renamed a number of London Underground stations. He's given a number of Tube stations some sheep-tastic names including Baaabican, Eweston and my favourite Rammersmith. 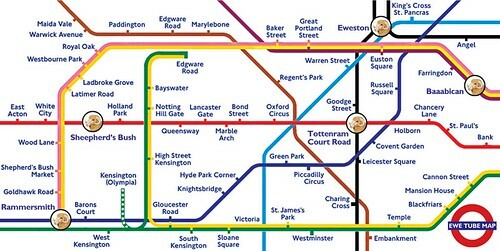 Paul McCartney tweeted a 'Ewe Tube' map pointing out the stations that were going to be rammed! Tottenram Court Road and Sheepherd's Bush Tube stations are also highlighted. 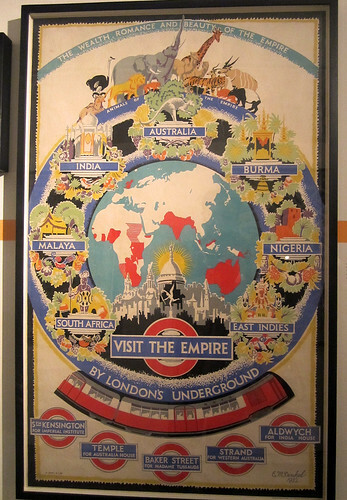 London Transport Museum opens its new exhibition - Mind the Map to the public today - 18th May 2012 which is running until 28th October. I was lucky enough to be invited to the launch party last night and took a number of pictures while I was there. 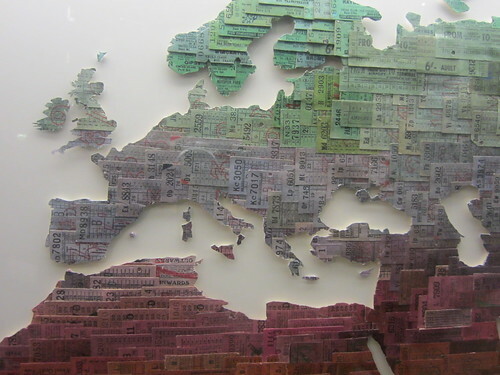 The Museum describe the exhibition as follows "Mind the Map: inspiring art, design and cartography will draw on the Museum’s outstanding map collection to explore the themes of journeys, identity and publicity. The exhibition will be the largest of its kind and will include previously unseen historic material and exciting new artworks by leading artists including Simon Patterson, Stephen Walter, Susan Stockwell, Jeremy Wood, Claire Brewster, and Agnes Poitevin-Navarre." I really enjoyed it (admittedly not as much as Sense in The City - which I think was the best exhibition London Transport Museum had ever put on) and there are some very interesting posters, scupltures, artwork and even interactive displays. 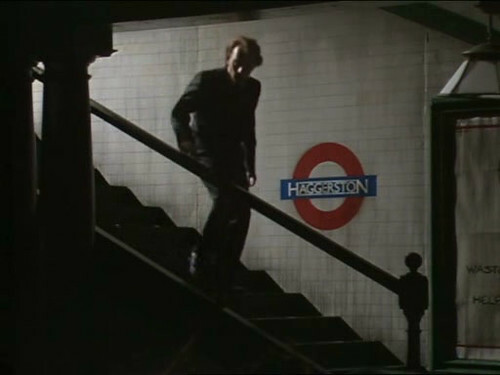 I've grown quite fond of The Great Bear now and it's led to a number of Tube Map "mash ups" where station names have been replaced by a whole host of things - anagrams, film titles, song titles, fonts, Dr Who characters - you name it. However I found Saptarishi quite puzzling. As did many others viewing it. But I suppose that's the point of it. You'll be saying "Why has he dedicated a line to The Murdochs? ", "What's their connection to the spies line?" "Why aren't Jedward on the Musicians Line?" Look out for a new poster display on the other side of the main exhibition space at London Transport Museum. 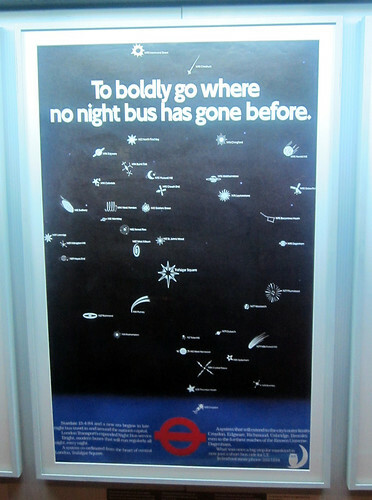 You'll see a playful poster from when Night Buses were extended to outer London to "Boldly go where no Night Bus has gone before"
TfL were keen to promote that the buses extended to outer limits - even "to the furthest reaches of the Known Universe: Dagenham"
A map made out of transport tickets - Momemento by Susan Stockwell was one of my favourites of the modern pieces. You can see the rest of my photographs from Mind The Map in this Flickr set. 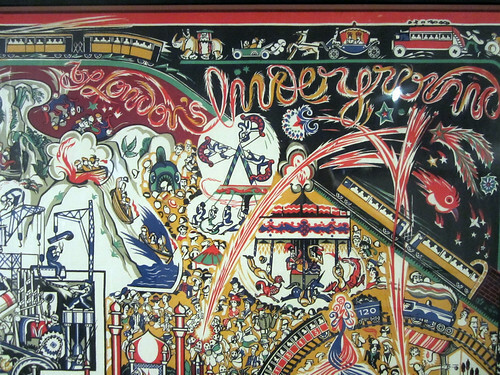 I will definitely make another trip to the exhibition if only to look the wonderful MacDonald Gill pieces from the 1940's and ponder more on the connections between people on Simon Patterson's map. 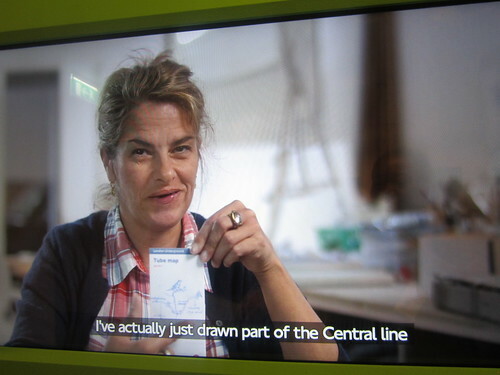 Tracey Emin's design of a bird on a "branch" of the Northern Line intersecting with the Central Line, will be the Tube Map cover we'll be seeing over the London Olympic period this year. 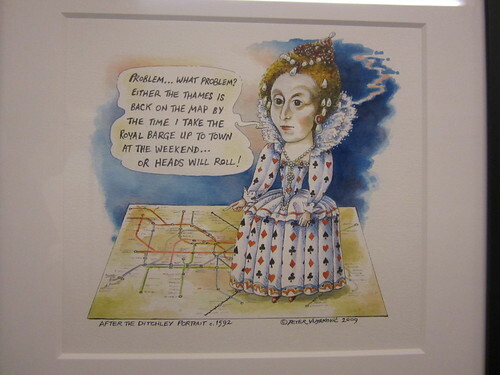 She's the latest artist whose work will now be seen by millions picking up a London Underground pocket map. 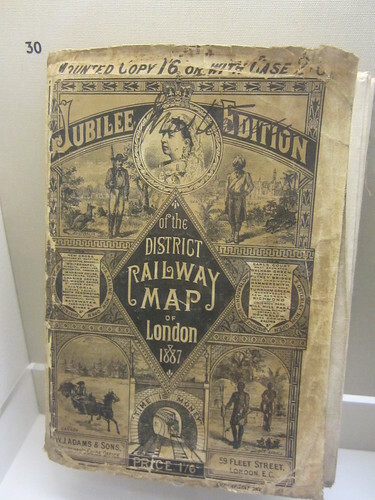 Around 18 million in fact, one of the largest print runs the pocket map has seen. It will be available from stations from June 2012. Those who might have been expecting something more ... err... Olympic themed will be disappointed. 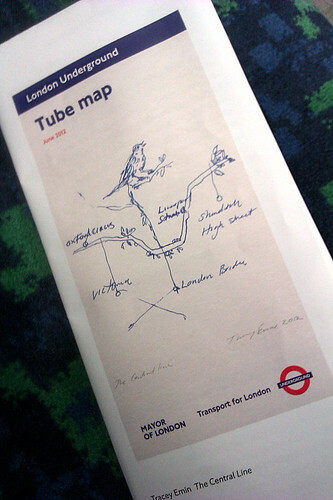 But it's certainly a bit of a coup for TfL to get one of the most talked about British artists to produce the map cover. 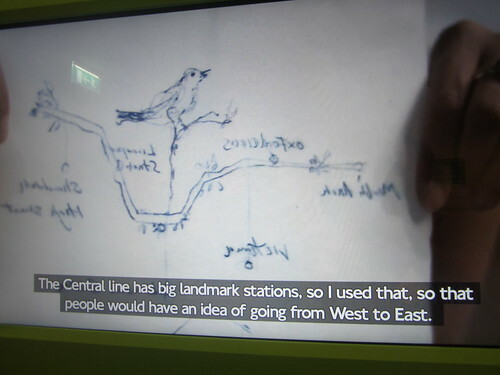 The design is in a video at London Transport Museum's new Mind the Map exhibition which opens to the public on 18th May 2012. I was invited to the launch of the exhibition tonight, where there is a video of Tracey talking about her inspiration for the design and what she wanted to achieve. For some reason in the video she is holding the design the wrong way around and says that the Central Line is a Tube Line she uses a lot "The Central Line has big landmark stations, so I used that, so that people would have an idea of going from West to East." She's cottoned on to the fact that tourists can find the Tube map confusing and felt a bird would help to make it feel "friendlier". 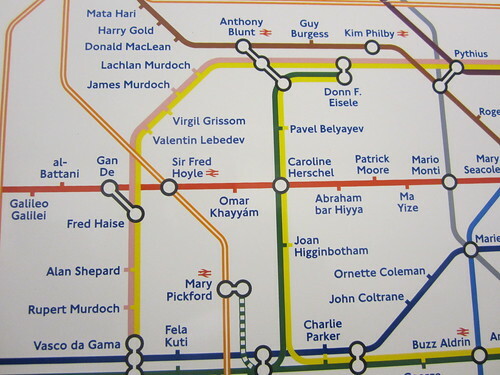 The Map cover's title is 'The Central line', but the only stations marked on the line are Liverpool Street, Oxford Circus and, I imagine with some artistic licence, Shoreditch High Street. 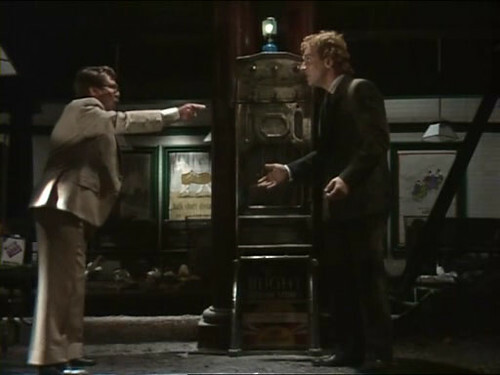 It shows Tracey's personal use of the line to taking her from her home in the East End home to the West End. 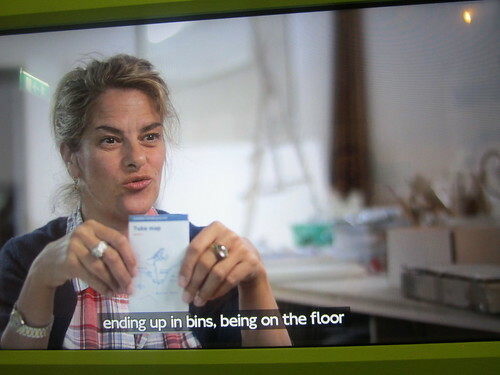 Tracey is used to people paying to see her art and found the concept of producing something that will end up in bins or on the floor quite daunting. 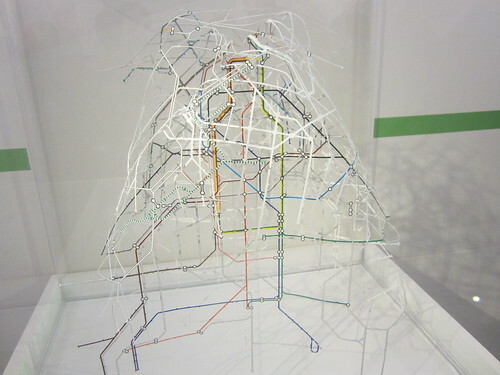 TfL have praised Emin’s artwork for adapting “the iconography of the original map to reflect her personal experience of the network and her ideas and experience of place.” Tamsin Dillon, head of Art on the Underground said the design is “a moving and unique interpretation of the Capital” . That's certainly one way to describe it. Like much of Tracey's work it will be talked about. Whether the maps end up becoming collectors items or as Tracey herself says "in bins or on the floor", this is one Tube Map cover that many people will have firm opinions about. What do you think of it? 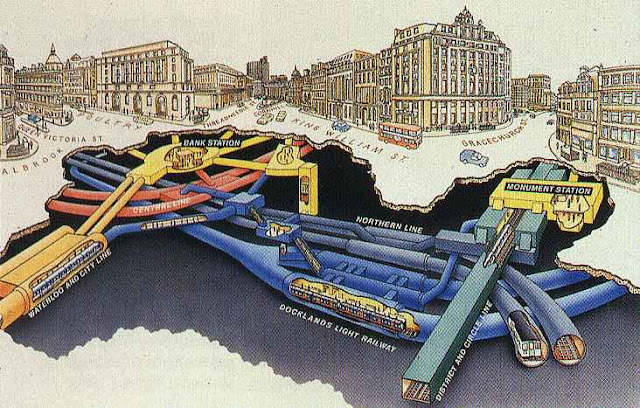 Particularly as a choice for a map that will be used over the London Olympics. Look out for the first of two new Jubilee line London Underground trains, which are wrapped in "decorative Jubilee livery" to mark the Queen's Diamond Jubilee celebrations, going into service this week. 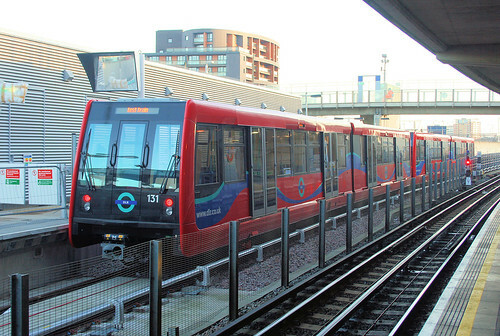 The trains will run along the Jubilee line up to and during the Diamond Jubilee weekend. The first wrapped train went into service on Monday 14 May 2012 and the second will be from 21st May. 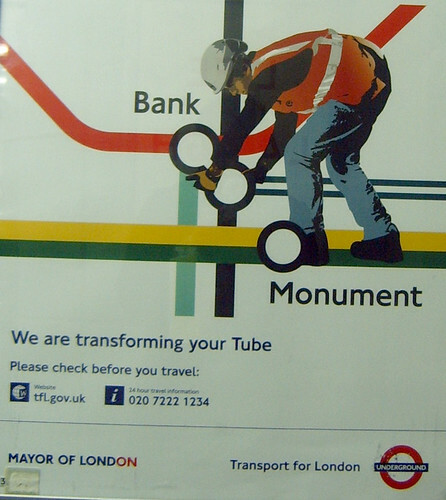 TfL have pointed out that the decorative wraps have been funded by Tube Lines "at no cost to the tax payer". 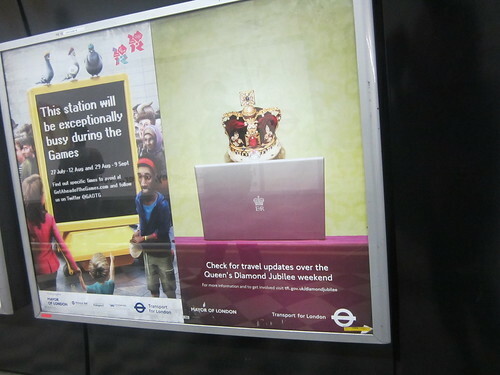 You've probably also spotted a number of posters around the system advising us to check TfL's website for any special travel arrangements over the Jubilee weekend. 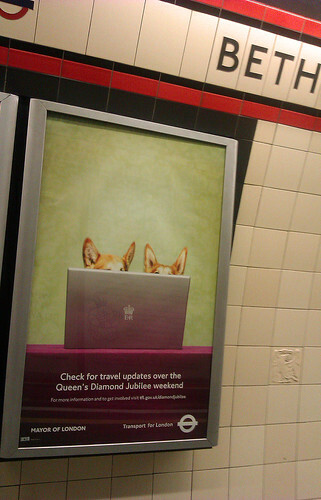 My favourite is one with a pair of corgis looking into a laptop. There's also images where only a guardsman's bearskin and the Queen's crown can be seen over the top of the "royal" laptop. 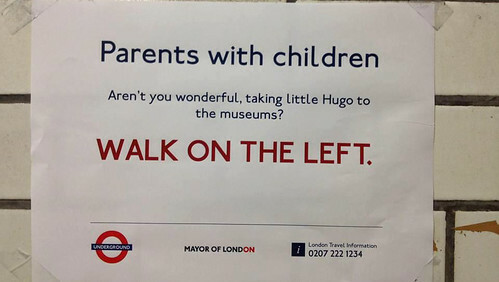 Has the perfect London Underground passive aggressive tone but with a bit of middle classed humour thrown in. Let's hope all the mums and dads with Little Hugo's follow the note and keep to the left. School parties with "walking buses" (bonkers phrase!) are hopefully well trained enough to do this already. 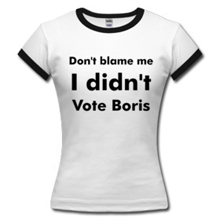 Hat tip to @AboutLondon who alerted this to me on Twitter. 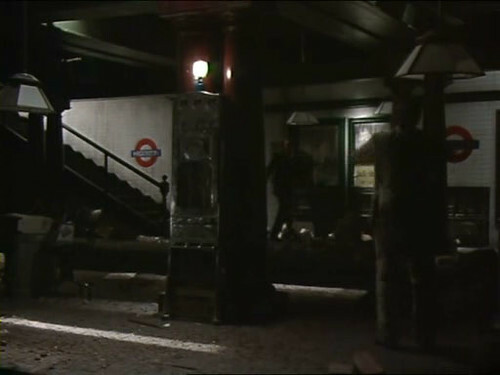 Came across what looks like is going to be an excellent set of short films based on the London Underground. In TUBE TUBE can listen in on Londoners travelling by Tube as they discuss love, work and life in London. To kick things off they're releasing the first five episodes of TUBE TUBE during week commencing Monday 14th May, one a day. Afterwards they aim to release a new film every two weeks. As the series continues, the characters and storylines will return and intersect. Here's a taster with the first film "Bonsai", was released on Monday 14th May. "It stars Nadine Lewington (Holby City) and Ian Smith (Popatron) at the tail end of an online date gone wrong. 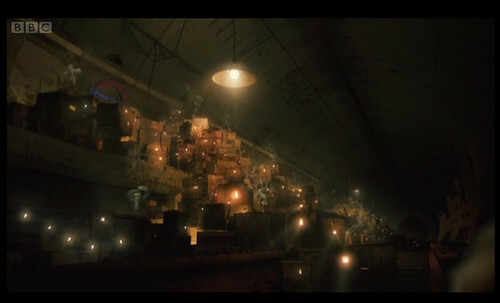 This episode was a finalist at the inaugural Sundance London Short Film Competition." In another attempt to keep us off the London Underground during the London Olympics, TfL have partnered with Recyclebank to produce an iPhone app where walkers & cyclists earn points. A number of you may be familiar with Chromaroma a points based game where you can climb a leader board for spending more time on the Tube, well this is the exact opposite. With Re:route, you to input the start and end points of your journey, and are then recommended a number of travel options, including cycling, walking and public transport. When you arrive at your destination (the app will have been tracking your with GPS), you're given five Recyclebank points, can see many calories you've burned and how much carbon dioxide you've "saved" if you opt for a cleaner mode of transport. Points here translate into discounts & offers. Recyclebank have teamed up with Marks & Spencer, Planet Organic, and health club Champneys. You can find the full list on Recyclebank's website. TfL's director of planning, Ben Plowden, said to Click Green: "TfL is supporting Re:route because it supports our wider efforts to encourage more people to consider cycling and walking as quick and convenient ways of getting around the city. More people cycling and walking will help to reduce congestion on our roads and on our busy public transport network. An initiative like Re:route is a great way to help TfL achieve these goals. Jonathan Hsu, CEO of Recyclebank added: "We’ve worked hard to make re:route an easy-to-use app so that people can easily travel around London on foot or on bike, and get rewarded for it. Although this app will be hugely useful during the Games to make it easier for people to seek alternative methods to get across London, we believe that Re:route will become part of a Londoner’s daily routine as it gives them a fantastic experience, with desirable rewards at all times." Currently only available from the App Store, there's an Android version, on the way in the "coming months". 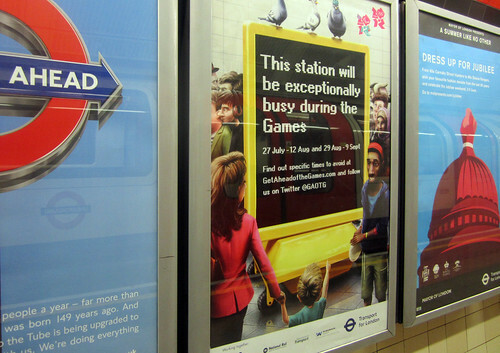 London Underground have said they will work day and night to strike an Olympic pay deal with transport unions. Currently both the RMT and Unite have rejected the offer from London Underground of £850 for each member of staff for working during the 2012 Games. "We do have a deal with the most important people, the Tube drivers, that was done last September. This last part, is really trying to sort out the last semantics" said Howard Collins, chief operating officer for London Underground, to LBC. 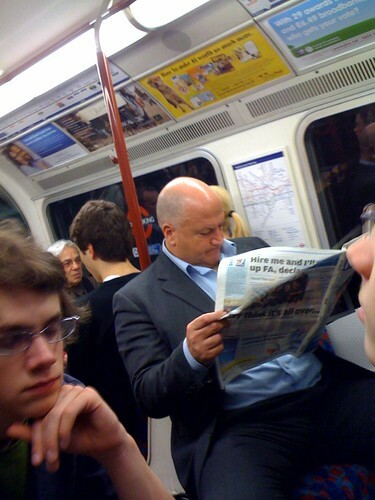 This Tuesday, 8th May 2012, he will be at ACAS with the RMT "trying to iron out the last few words that need sorting. We're confident and I know Bob Crow the leader of the RMT, doesn't want to disrupt the Olympics, we've got to work together on this, and find a solution. If that means burning the midnight oil all next week to sort it, lets get focused on London and the Olympics. We're all positive about it and just want to get this last piece out of the way." Apparently some of the "few words that need sorting" are that the RMT are unhappy about are the requirement for 'unlimited flexibility'. Knowing the flexibility of union leaders this shouldn't come as a surprise. An ‘expression of interest’ document is currently circulating London Underground depots asking all drivers to state what shifts they are prepared to work during the Olympics and Paralympics. RMT's London Regional Council said "Until such time as the union reaches agreement with London Underground all members are advised not to fill in or return these forms to management." Howard Collins said "We've been talking to the other unions too, we know Unite have asked their members what they wish to do and that information is coming in, we're pretty positive. The dialogue we've had with ASLEF has been very positive. But it's really about the issue with the RMT and we really want to get them into the party to make sure that deal is done." Transport Tests toook place on 5th May 2012 - 'Super Saturday' as 80,000 people visited the Olympic Park in Stratford for the first time. Collins said "Transport for London is working hard with our Olympic and Paralympic partners to ensure that we can deliver a fantastic 2012 Games this summer. We know that the Games are a huge logistical challenge, however our detailed planning and testing, along with our experience of dealing with large-scale events, means we are confident that we can keep London moving during the Games." Update - 10th May 2012 - LBC report the that talks over the £850 one off payment at conciliation service ACAS between LU and the RMT have ended without agreement. "The Union claim a deal was agreed and close but was reneged on by transport bosses who've concluded a similiar deal with the Tube drivers union ASLEF. Now they're promising a ballot for industrial action "very soon" short of a strike during the Games." 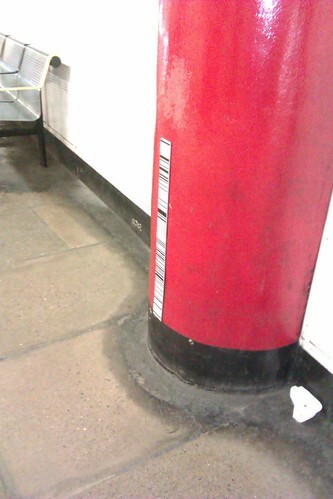 Barcodes on Tube Platforms - Anyone know what they are? Does anyone have any idea what these things that look like barcodes are? I spotted them for the first time a couple of days ago at Liverpool Street London Underground station, and am pretty positive I've not seen them anywhere else. They might not even be bar codes but certainly look like they could be measuring something or would possibly activate a sensor when a train passed. I really have no idea, but am certainly curious to find out if anyone knows. Here's one closer up which may help with identification. Thanks.